What it is like for them to wake up and hardly be able to move their feet from the mattress to the floor. Why they sometimes can’t “get it together” before lunch time. Why it seems that they have suddenly become forgetful, emotionally sensitive, and much more. Note: Interview will open in another tab. To get back to MyFMDay click your first tab. And they have added a commercial in front, I’m so sorry. Deep Blue Aromatic Oil for Pain. This oil will relieve your pain within a couple of minutes! It’s guaranteed to work or your money back. It’s the blue tansy oil. It’s expensive, but it is worth it! 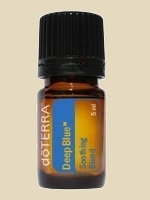 Deep Blue is a soothing solution for fibromyalgia, chronic pain sufferers, and those who have achy joints and muscles. This aromatic oil gets it’s name from the blue tansy, camphor, peppermint and German chamomile among others. The effects of this music is very definite and sure! There are other CDs I use for relaxing and even sleeping, but as a Fibromyalgia patient, ‘Music To Promote Sleep’ provides a deeper relaxation and I get to sleep faster. Every time I need to deeply relax, need a change, or my pain level is too high, I use this CD with my noise reduction headphones. There are sounds like angelic voices bidding you to listen to their dreamy harmonic tones leading you down their slow melodious path, and your drifting. At 4-7hz- light sleep, “theta”. At 0-4hz- you’re in deep sleep, “delta” waves.